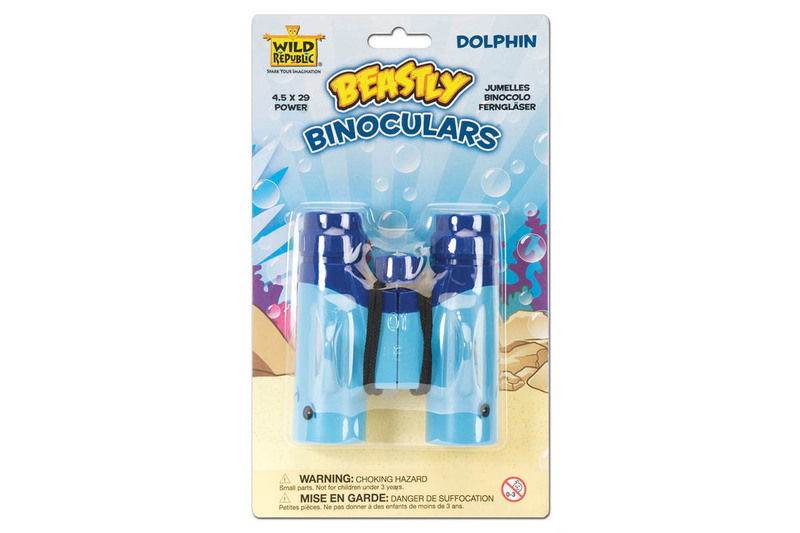 Great set of binoculars for your nature loving kids. Kids can go bird watching, whale watching or nature watching. Dolphin design, compact binoculars and comes with a neck strap. 4.5 x 29 power magnification. There are over 30 different species of Dolphin around the world, many living in the waters around Australia. The most common species of Dolphin is the Bottlenose Dolphin. Dolphins are warm-blooded mammals and give birth to live young, breathe air and have a very social nature. Dolphins are in great threat from a wide variety of objects and actions within the water. They and other marine life often get caught in fishing lines, and have difficulty with Stainless Steel hooks caught in their mouths. Human rubbish and other waste products can also be swallowed by Dolphins, causing pain and even death. They also often have difficulty getting out of the way of speed boats and jet skis. You can help our dolphins and marine life by disposing of your rubbish properly and even picking up any you see on the beaches and putting it in a rubbish bin.